Devil’s Hopyard State Park in East Haddam, Connecticut is supposedly named for the large, smooth “potholes” that can be found in the bedrock beside the rushing water of Chapman Falls. The most colorful story of the creation of these potholes is said to derive from colonial times when Puritans inhabited the area. In short, it states that the Devil was on a leisurely stroll through Eightmile River when he reached Chapman Falls and accidentally got his tail all wet. Apparently, the Devil hated getting wet (just like house cats) and proceeded to furiously stomp and “hop” his way down the waterfalls, literally burning potholes in the rock beneath his feet as he threw a demonic temper tantrum. Not convinced? Well, I don’t think anybody buys that story, especially historians who posit the more believable explanation that Devil’s Hopyard was once in close proximity to a field, or “yard”, where hops was cultivated for use in making beer. Where the historians leave off, geologists have stepped up and conclusively demonstrated that the potholes in the bedrock were not melted beneath the feet of a pouting demon. 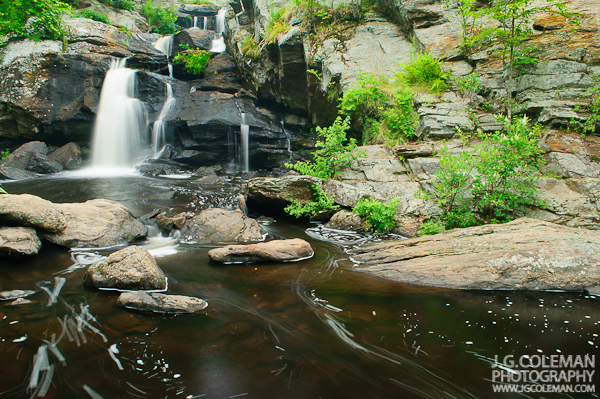 Also known as “kettles” or “giant’s kettles”, the potholes beside Chapman Falls developed as a result of erosion. Over the centuries, as water endlessly spilled upon the tiers of bedrock at the waterfall, eddies would develop where stones and grit had an opportunity to settle at the bottom of the river. This detritus, which was harder than the bedrock, was then swirled around and around by the current, boring a depression in the riverbed. As the depressions grew deeper and deeper with time, the eddies would have become more prominent, larger pebbles and greater quantities of grit would get stuck, and the process of erosion would accelerate. Eventually, the depressions became deep, smooth potholes in the rock which are easily observed today, especially during summertime when water levels are reduced. Probably owing to the unique legend associated with Devil’s Hopyard, the potholes found there at Chapman Falls are some of the most well-known in the entire state. However, similar potholes can be found all over Connecticut’s parks and preserves wherever the conditions for their formation are present. I can specifically recall finding them near Buttermilk Falls (Plymouth), Kent Falls (Kent) and Westfield Falls (Middletown), to name only a few. Photograph of Devil’s Hopyard State Park © 2011-2012 J.G. Coleman Photography. View more photography by Trails of Freedom Chief Researcher, Justin Coleman, at J. G. Coleman Photography.